Welcome to the Southern Region Leaders Retreat — We have an incredible event in the works and look forward to seeing you there! The Southern Regional Leaders Retreat is an interdisciplinary gathering for leaders in the South who are connected by our commitment to improving the quality of and access to support families have when raising children. That includes from preconception to postpartum and beyond — whether those efforts center children, gestational and adoptive parents and other caregivers, whole families, or large-scale community issues. What are our communities’ needs? How are they being addressed now and by whom? Who is being served, and who isn’t? Where are we needed and welcomed? How do we support work that is already being done? How to we interrupt, repair, or replace broken systems? Asking other organizers in different areas of work: What do you need most from us? * There will not be any sessions on how to use a baby carrier during the retreat. If you are interested in developing skills using and teaching the use of carriers, please enroll in our day-long institute scheduled for Sunday, June 23 at the same venue. baby carrier educators, pregnancy, birth and postpartum professionals, community health workers and advocates, family supporters, reproductive justice organizers and activists. The Southern Regional Leaders Retreat is a needed extension of the Texas Babywearing Leaders Retreat, which was held in 2015 and attended by approximately 80 birth and babywearing professionals and community members. This year, our space limits in-person attendance to 50, with unlimited digital zoom attendance opportunities. We have broadened the name and intent of the retreat to build on the goal of community and collaboration beyond state lines and specifically “babywearing.” As birth and postpartum community leaders and organizers we know the importance of building stronger communities, making deeper connections, and collaborating with those doing similar work. We welcome attendees from anywhere in the world, but our intention as residents of the South is to center and focus on the needs specific to all people in our own neighborhoods and communities. The retreat will be held June 20 to 23, 2019. Welcome and networking begins Thursday evening (6/20), with primary workdays on Friday (6/21) and Saturday (6/22), and lighter wrap-up on Sunday morning (6/23). We will share more information on the event website in the coming weeks, so please stay tuned! We are honored and excited to bring you the Southern Region Leaders Retreat! 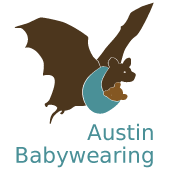 HUGE thank you to Austin Babywearing and the team of leaders working to make this event successful!